Mmmmmm....could it be, that we're just about to go online and pay our semi-annual property taxes on our little money pit? Uh. . . sorry it's a few days late. (plus "administrative fee" for paying online ((((grumble like Pele)))).Sock it to me (sigh) . . .
We post this (hopefully) with the cherished permission of the above copyright holders -- and we urge to you visit Mr. Peters' splendid site -- and those of his corporate overlords -- one King Features syndicate. Please also, visit Grimmy's patrons, the Red Cross, and Humane Society. a) It's every good American's civic duty to to ALWAYS pay their taxes, right Mr. Geithner, Mr. Treasury Secretary, sir? b) It's all going to good use . . .
c) ...uh... it is ALL going to good use . . . isn't it? As divers and such with more than a nodding familiarity with the "great" white shark, Friday's news arrived with much sadness. Of course, it's a terrible tragedy when someone dies before their time in a terrible way. A 66-year-old retired veterinarian, training for a triathlon, was bitten by a white shark off Solana Beach in San Diego County, USA, and died onshore. The local daily's report can be found here. While it is noted that such attacks are extremely rare, missing is the larger context of the white shark's own fate. Like that of any other shark in the ocean these days, it has more to fear from the voracious appetites of humans. Above shark was photographed off Isla de Guadalupe, Mexico, where annually, they are sighted by shark tour operators and sport fishers. White sharks are a protected species, because their populations around the world are so low. An eye-opening little ticker on the site Shark Foundation continually counts the number of sharks that are killed around the globe, mainly for their fins -- estimated at 3 every second. "Jaws" novelist Peter Benchley noted before his passing that he could not have written his blockbuster today, as it was unrealistic. We know now that humans are not their primary prey, and we know now that humans are a greater threat to the shark species than the other way around. The global population is threatened, as sharks are slow to reach reproductive age, and have a slow gestation period. No small solace to the swimmer, his family and friends and the greater community of Solana Beach, but well worth noting, nonetheless. 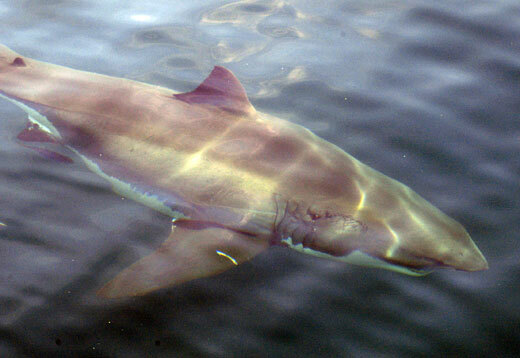 And, oh yes, white sharks have been known to frequent Hawaiian waters, but are also thought to be rare here as well. The most notable incident came when the foolhardy captain of a shark tour boat off Honolulu, jumped into the water with one (sans shark cage), and swam for nearly 45 minutes with a large female. Tiger sharks appear more frequently here. They, like white sharks, are mainly ambush predators, striking from behind or below in poor visibility. Experience here is, if you face 'em head on (if you're unfortunate enough to be sharing close proximity) they generally steer clear. Attacks against scuba divers are exceedingly rare, as sharks, like most fish, tend to shy away from our noisy, odd, air bubbles. Check out our article, photos and video on The "Last" ski season in Taos, for more examples. But, we really love Kona, and we'd like to share some of our thoughts, images and more from our frequent visits there. 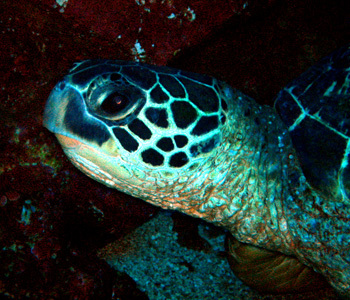 Of course, we do like to talk a bit of story here, so, the above snap of a big ol' green sea turtle, was actually taken during a wonderful dive off Lanai. Okay, so, maybe he doesn't look so welcoming here, but it is honu's way, and we wouldn't have it any different. We thank Capt. Steve Juarez and his crew at Hawaiian Rafting Adventures for the bon voyage, and Maui West Cottages for the luxurious accommodations for a few days. Now, as for humble little C31, tou can see images and info on our condo at the website of our great management team, Geri and ATR. You can also check out the condo's rate and reservation schedule, and see if the condo is available during the time you'd like to come to Kona. Make sure check back on occasion. We say that only tongue firmly in cheek, as the Smithsonian magazine's travel folks have come up with a list of the top 28 places to see in the world before you kick it, and the Big Island is NOT ON THE LIST! (Capital letters meant to imply astonishment). So what if we're biased, but no mention of the constantly erupting volcano Kilauea, world's most active? What about the snow peaked Mauna Kea, home to the largest collection of powerful telescopes that help us peer off into the nether regions of distant galaxies? No mention of Waipio Valley, a place like no other? Here's a link to the compleat articulo. "Tropical storm Flossie weakening fairly rapidly south of the state early this Wednesday morning. While thick, dense overcast clouds remained immediately south and southeast of the Big Island, the low cloud circulation center was sneaking out from beneath the higher clouds (and) was moving due west. 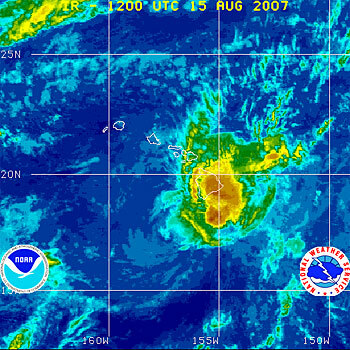 The center appeared to be about 125 miles south-southwest of South Point, the southernmost tip of the Big Island. 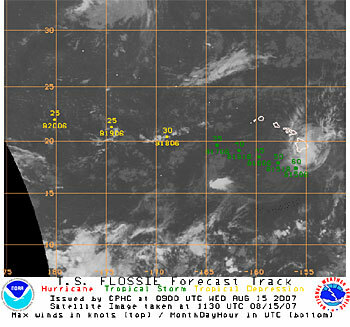 Thick cirrus clouds from Flossie covered the Big Island while more fragmented cirrus passed over Maui county and quite frequently across Oahu. These high clouds were not reaching Kauai. The coldest cloud top temperatures near the Big Island were near -60 degrees celsius which related to heights up near 42000 feet." 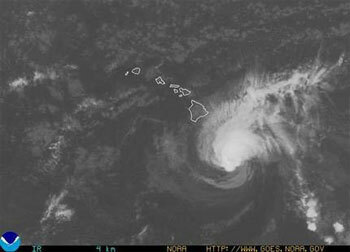 "Hurricane Jimena weakened into a tropical storm and continued westward past the southern tip of the Big Island yesterday, kicking up surf and dumping rain, but doing little damage." "SOUTH POINT, Hawaii (AP) -- Hours after getting jolted by a moderate earthquake, residents of Hawaii's Big Island holed up for a different force of nature Tuesday: Hurricane Flossie, expected to deliver up to 10 inches of rain, waves as high as 25 feet and strong winds in a powerful but glancing blow." How do we get roped into such things? Well, we performed a search for "news from Kailua-Kona" on ask.com (not google -- they're currently in the midst of trying to track each and everyone's personal search habits and make them public for financial gain). Anyway, topix.net's feed about the Big Island is here. RoboBlogger, who edits the Kailua Kona News pages on Topix when no humans are available to help.